A “Forweird” by Michael Moorcock gives us a brief history of the weird tale, discusses how it has defied publishers’ attempts to categorize it into neatly-bordered genres, and gives examples of writers who are revered by modern readers but whose weird fiction caused them to be marginalized during their lifetimes. Moorcock also attempts to explain why we like weird fiction and relates the affinity for strange tales, at one time or other, to the popularity of psychoanalysis, the development of easily-consumed mass communication, and the desire to rock the literary boat once in a while when genres become staid. Or, Moorcock suggests, perhaps we just occasionally like to be disturbed. Next, Ann and Jeff VanderMeer’s introduction begins to define “Weird” by reminding us of H.P. Lovecraft’s 1927 definition: “something more than secret murder, bloody bones, or a sheeted form clanking chains.” The VanderMeers suggest that weird stories are dark and make us uneasy, but can at the same time be beautiful. They also discusses the influences of surrealism, Decadent Literature, New Wave and Gothic and then offers a detailed history and evolution of the weird tale with recommended authors and stories (most of which are included in this volume). Then come the stories — 110 of them arranged chronologically starting with stories from 1907 and 1908 from Alfred Kubin, F. Marion Crawford, and Algernon Blackwood and ending in 2010 with a story by K.J. Bishop. In between are stories by men and women from all over the world including Lord Dunsany, Abraham Merritt, Franz Kafka, H.P. Lovecraft, Clark Ashton Smith, Fritz Leiber, Ray Bradbury, Jorge Luis Borges, Shirley Jackson, Robert Bloch, Mervyn Peake, Daphne du Maurier, James Triptree Jr., George R.R. Martin, M. John Harrison, Octavia Butler, Clive Barker, Lucius Shepard, Harlan Ellison, Elizabeth Hand, Poppy Z. Brite, Haruki Murakami, Lisa Tuttle, Stephen King, Angela Carter, Tanith Lee, Kelly Link, Caitlin R. Kiernan, Michael Chabon, China Miéville, Neil Gaiman, Jeffrey Ford, Jeff VanderMeer, Daniel Abraham, Margo Lanagan, Laird Barron, Liz Williams, and so many more… Each story is introduced with a paragraph explaining the author’s credentials, awards, and influence in the field. Last comes an “Afterweird” by China Miéville which is just weird enough to deserve a place in this anthology. Miéville, not surprisingly, discusses the etymology of the word “WEIRD” and, as he recaps some of the unsettling things we’ve encountered in this compendium, wonders how useful etymology is when defining something as “weird.” Instead, he suggests that weird is personal, state-dependent, and “We know it when we feel it.” Lastly, Miéville proposes that “weird” is contagious, infecting your brain and the stories you read from now on. The Weird: A Compendium of Strange and Dark Stories is not meant to be read front to back all at once, but is rather more like a manual or primer in the scholarly field of Weird Fiction. I read many of the stories (most of them were stories I had not previously read) and familiarized myself with a few authors I’d never heard of before. I look forward to reading all of these weird tales eventually and I’m glad to have this text on my shelf. 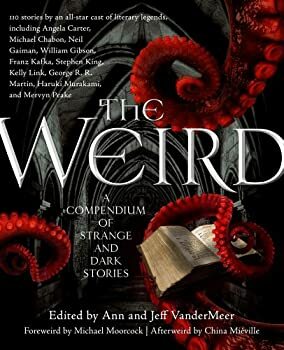 The Weird: A Compendium of Strange and Dark Stories deserves a place on every speculative fiction lover’s bookshelf. The Weird: A Compendium of Strange and Dark Stories — (2012) Edited by Ann and Jeff VanderMeer. Publisher: From Lovecraft to Borges to Gaiman, a century of intrepid literary experimentation has created a corpus of dark and strange stories that transcend all known genre boundaries. Together these stories form The Weird, and its practitioners include some of the greatest names in twentieth and twenty-first century literature. Exotic and esoteric, The Weird plunges you into dark domains and brings you face to face with surreal monstrosities. You won’t find any elves or wizards here…but you will find the biggest, boldest, and downright most peculiar stories from the last hundred years bound together in the biggest Weird collection ever assembled. The Weird features 110 stories by an all-star cast, from literary legends to international bestsellers to Booker Prize winners: including William Gibson, George R. R. Martin, Stephen King, Angela Carter, Kelly Link, Franz Kafka, China Miéville, Clive Barker, Haruki Murakami, M. R. James, Neil Gaiman, Mervyn Peake, and Michael Chabon. This sounds like one I may have to acquire for my shelf as well.It sounds like the list of authors is pretty inclusive of some of the greats in the weird tale/fantasy genre with many of my old favorites, and also some authors I’ve not yet read but keep meaning to. I also like your suggestion of not trying to read the whole book at once, but of going back to the book periodically and using it as type of manual or textbook in a sense, but what can you expect from someone who loves school so much he’s spent his whole life in it. Seriously though, great review! Thanks again for posting this.